Heavy-duty drainage fabric is a perfect solution for drainage areas which require a tougher, thicker fabric than our standard drainfield fabric. Our selection of this heavy-duty fabric is available in weights ranging from 3 oz - 6 oz and in a wide variety of different widths. Landscape fabric is used in landscaping for water to pass through. Drain Field fabric is used in septic drain fields as a filter. They both act as a barrier, are from the same class of synthetic textiles and are similar in their construction. Geotextile is a fabric used in landscaping, drainage and engineering. These synthetic fabrics are also permeable, meaning gases and fluids can pass through them. That is why geotextile materials are used for situations where barriers are required but the transfer of water and air must be able to pass through the barriers. While landscaping fabric and drain field fabrics are both geotextile materials, they are also very different for very different applications. Landscape fabric is used as a physical barrier (a weed barrier) in gardens and planting beds. The fabric is placed on the ground, between plants/crops, forming a barrier that allows air and water to pass through the fabric in order for plants to grow. It also serves as a barrier that blocks out the growth of weeds, preventing them from taking root. The fabric also blocks out light which will keep weeds from germinating. Drain Field fabric is used as a filter for a septic drain field. A drain field consists of a layer of soil and/or sand over a layer of stone and a layer of fabric is placed in between the soil layer and stone layer. Water and air are allowed to pass from the soil layer to the stone layers but will not allow the soil to shift into or through the stone layer. Should soil move and infiltrate the surface beneath the stone, it would reduce the effectiveness of the drain field. This is why the fabric plays such a crucial role in protecting the drain field's operational ability. 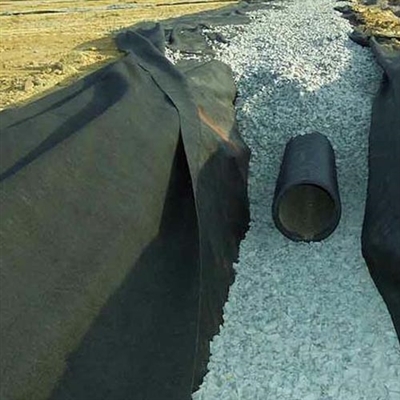 Even though landscape fabric is utilized as a biological barrier, geotextile materials are more often used in various applications that take advantage of their filtration abilities. For instance, road construction normally use these materials as permeable dividers between different layers of materials in the roadbed. This, in turn, is similar to drain fields. 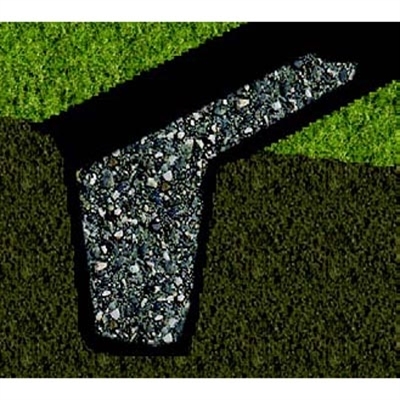 Geotextiles are also commonly used to prevent erosion on hills and slopes because they form a barrier preventing soil from moving, while still allowing water to pass in and out of the soil. This form of passage eliminates the buildup of soil water pressure that can easily destabilize the hill or slope. As you know, gutters capture water as it runs off the roof, French drains deal with the water at ground level. When it rains, water has a habit of pooling in particularly low spots on your property. By rerouting the flow of water with a French drain, the situation is being alleviated. A French drain will also solve your basement problems from water. Basements allow water to seep in through the foundation, causing water pressure against the foundation and gradually leaking through to the basement. A French drain, as water approaches the foundation will reroute and deposit it somewhere else. If you are experiencing continual water in your basement, you probably have an inadequate outdoor drainage and should install a French drain indoors. This involves cutting a trench in the basement slab that runs the perimeter of the foundation. Then a pipe is laid in the trench, followed by a sump pump that will move the water from the inside to the outside. Trench assembly in your yard or your basement works on the same principle as a French drain. The first step is digging out a slope in the direction you want the water to flow. It is recommended you have a slope of 1-inch for every 8 feet in length. In order to figure out the correct angle, use a level string tied between the stakes, then measure the distance from the reference point to the trench bottom. There is a direct relationship between the diameter of the drain pipe and its relative effectiveness. Your trench should be no smaller than 12-inches wide and a depth between 18 to 24-inches. If you are installing a French drain around your foundation, make sure to position the pipe below the slab or finished floor level. After digging your trench, fill in with a few inches of crusted stone, cover the stone with water-permeable landscaping fabric to prevent weed growth and lay the piping into the trench. You can choose one of two types, either a rigid PVC with predrilled holes or a flexible drain pipe cut with slits. Note: PVC lasts longer, should you encounter a clog just clear it with water pressure or a plumber's snake. The flexible pipe is less expensive and is actually easier to work with. One thing to remember about PVC installation, adjust the pipe holes downward. Illogical at it might seem, French drains work by letting water flow into them from underneath. Wrap landscaping fabric around the pipe to keep dirt and roots from getting in the way of the system. Fill in the trench with gravel to grade and, alternatively, with gravel to a few inches below grade. Add dirt to the remaining distance. Even though covering the pipe could cause difficulties for future maintenance, doing it this way, allows the French drain to be totally concealed. You could purchase a flexible-perforated pipe that comes already encased in water-permeable fabric instead of wrapping a pipe in landscaping fabric. Also, if you are going to have a long trench, rent a trench to save time. Place a catchment barrel at the terminus of your drain to collect rainwater for your garden. After creating your trench, you will have quite a bit of excess soil, so before starting the project you might want to come up with a plan for this soil.